The first time I smoked a Punch cigar I was expecting a wallop that never arrived. It’s called Punch for a reason right? Yes, it is, but that’s not the reason. Punch ultimately derives its name from the “Punch and Judy” puppet shows that were popular in England and France in the 18th and 19th centuries. The plots of the shows were always improvised, but they ran along a familiar line. Punch, an abysmally inept caretaker, is left in charge of the Baby while his wife, Judy, exits momentarily on an errand of some sort. She returns to discover Punch sitting on the poor puppet child, or she finds out that the infant has been run through the sausage machine, or some other unutterable abuse has occurred, upon which she flies into a rage. After assaulting Punch with a conveniently placed implement, a policeman appears, a fight breaks out, and slapstick ensues. Other characters occasionally appear: crocodiles, ghosts, Toby the Dog, et al., and then the show concludes with a battle between Punch and the Devil. Naturally, Punch escapes the retribution that the Dark Puppet has arrived to exact. Charles Dickens said, “In my opinion the street Punch is one of those extravagant reliefs from the realities of life which would lose its hold upon the people if it were made moral and instructive.” So don’t go looking for a moral to this story. The character that appears on the band of the Punch Signature cigar is Punchinello, as he is depicted in the 18th century British humor magazine, which borrowed the character from the well-known street shows. None of which has to do with the power of a cigar. The Punch Signature might change all that. Agustin Garcia, the blender of the Punch Signature, says that the Punch Signature was inspired by the original Punch blend, but it is clearly a much different cigar. He asks us to “think of it as a brother who has a lot of fire in him, but also respects tradition and the family name.” Truth be told, I think this brother might have been adopted. Punch Signature was built around an Ecuadorian corojo wrapper specially cultivated for this blend. 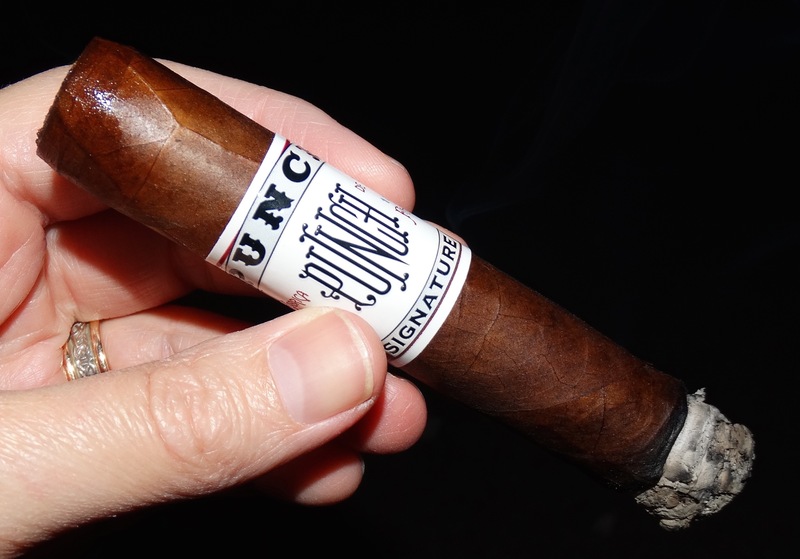 The binder is a proprietary Connecticut Habano, and the filler is Dominican and Nicaraguan, “of the same variety as the original Punch blend.” The blend is composed of both aged and younger leaf to achieve a balance between the flavor of the old and the strength of the young. The Robusto is about as well made as one could expect — and one does expect this from General Cigar. The wrapper is a dark and oily colorado maduro. The head is nicely rounded and clips well, but the cap is a little messy. Examining the business end of the cigar I notice swirls of darker tobacco in the filler bunch. The roll is solid, the draw is excellent, and the burn is slow. The ash is firm and yellowish gray, but a little flaky on the surface. This is easily a 90 minute smoke for me. Aside from the occasionally sloppy cap, the construction values here are above par. A burst of black pepper coats the tongue and palate in the first segment of the Signature Robusto. There is some astringency here that I associate with Nicaraguan blends, but there is also a lot of leather in the aroma. The pepper gradually subsides, making way for flavors of leather and seared meat. There is a barbecue-like quality to this cigar, a burnt fatty char similar to what you get from the Maillard reaction when searing a good steak. The aftertaste is earthy and the pepper returns for an encore, but for the most part the flavors don’t change too much. It’s not a subtle smoke, and would probably make a good companion at the grill. The Punch Signature is a cigar that truly lives up the pugilistic character that the Punch name suggests. It calls for a hearty meal beforehand and a drink that can speak truth to power for about an hour and a half running. MSRP is in the $6-7 USD range. That’s not out of line, though it has some serious competition at that price. 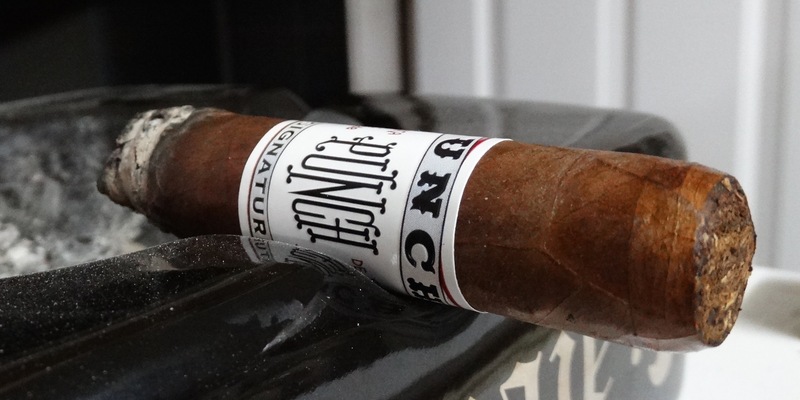 Special thanks to General Cigar for providing samples of the Punch Signature Robusto for review. Hmm, gonna have to pick one of these up.